What is PeopleSoft Grants Management? PeopleSoft Enterprise Grants Management is a completely web-based grants management solution developed by Oracle Corporation, a multinational computer technology company based in California which has been developing and marketing popular database management systems, enterprise resource planning solutions, customer relationship management tools, supply chain management programs, and other business applications. PeopleSoft Enterprise Grants Management is a component of Oracle’s suite of applications known as PeopleSoft Enterprise Service Automation. This end-to-end enterprise grants management solution is built for organizations, agencies, and institutions who are managing federal-funded research and projects, enabling them to streamline pre-and-post award processes, handle the entire research administration lifecycle, come up with grant proposals automatically, generate flexible financial reports, and comply with the requirements being enforced by their institution or agency and sponsors. PeopleSoft Enterprise Grants Management is built with grant administration workflow templates that users can configure. Through these templates, they will be able to efficiently perform administrative tasks and automate the process of submitting, reviewing, and approving grant protocols and proposals. The solution organizes all data and information in a central repository which include financial data, grant proposal versions, award information, grant opportunities, and more. Thus, employees within the organization and stakeholders are provided with a single source of information, allowing them to easily share information and collaborate with each other. The solution provides organizations with ways to achieve sustainable compliance such as the ability to accomplish, print, and electronically submit SF 424 R&R forms which are required for grant applications. 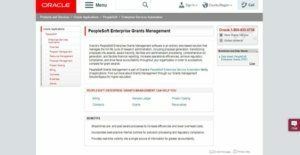 Last but not least, PeopleSoft Enterprise Grants Management supports integration with the PeopleSoft Enterprise’s suite of applications as well as with third-party systems. Such integration permits users to make most of their resources as they handle their portfolio of federal grant awards. PeopleSoft Enterprise Grants Management helps organizations, agencies, and institutions seamlessly handle all processes and activities involved in grants administration from proposal generation to award management. This enables them to automate administrative tasks, boost productivity, and comply with institutional and sponsor requirements. With PeopleSoft Enterprise Grants Management, users will be able to easily generate grant proposals regardless of their complexity. While they are creating proposals, they can add relational structures and a variety of sites and rates, as well as include multiple budgets. The enterprise grants management solution automates the process of submitting, reviewing, and approving grant protocols and proposals through the aid of its configurable workflow templates. As a result, this optimizes and accelerates how all the people participating in the grant protocol and proposal lifecycle communicate and collaborate with each other. When it comes to award management, the solution enables users to set up the needed elements for managing awards using the same component or functionality of the software they have used for generating their proposals. PeopleSoft Enterprise Grants Management makes sure that awards are closed properly. The solution can automatically track closeout activities and provide a complete audit trail of the activities. PeopleSoft Enterprise Grants Management is equipped with a central repository where enterprise-wide data are organized. Thus, it can gather information from disparate sources and consolidate them in one place, giving employees and stakeholders a single source of information. Because the solution provides a single source of information, principal investigators, program directors, and employees will be able to seamlessly work with each other, making it easy for them to access and share the same information. They can view information related to grant proposals and awards from the central repository and collaborate with each other efficiently. Protocol processing is automated in PeopleSoft Enterprise Grants Management. This involves the creation, submission, and modification or renewal of protocols required for human and animal testing. PeopleSoft Enterprise Grants Management has an automated system that streamlines the capturing and amendment of human and animal protocols. Users can track multiple versions of protocols which they can use as a basis for generating new protocols or changing existing protocols. If they want to modify a protocol, all they need to do is to copy that protocol and apply the changes. In addition, in terms of approving protocols, the solution ensures that approving authorities are able to immediately review and approve protocols through automated protocol workflows and notifications. PeopleSoft Enterprise Grants Management can assist grantseekers in complying with regulatory requirements as they look for grant opportunities and submit grant applications. To help users achieve compliance, the grants management solution integrates with Grants.gov. Grants.gov is an e-governance site and web-based application that allows federal grantmaking agencies to post grant or funding opportunities and specify the requirements that grantseekers need to meet as they apply for the available grant programs. Users can invoke the web services offered by Grants.gov to search for grant opportunities, send grant applications, and track the status of their submitted applications. Once they selected a grant opportunity from the list opportunities provided by Grants.gov, the grants management solution enables users to capture the opportunity data including all the schemas related to the opportunity and forward them to the grant proposal functionality of the solution. To wrap it up, PeopleSoft Enterprise Grants Management is an end-to-end grants management system which means it can handle the full range of pre-and-post award processes, encompassing financial aspects. Indeed, the solution’s integration capabilities make it a truly end-to-end grants management system. PeopleSoft Enterprise Grants Management can be complemented by the applications that belong to the PeopleSoft Enterprise family of applications which is developed by Oracle Corporation. For instance, it can be integrated with PeopleSoft Enterprise’s financial management solution. As a result, users can review and evaluate journal entries, expenditures, and purchase orders while they are performing grants management activities. Integrating PeopleSoft Enterprise Grants Management with PeopleSoft Proposal Management allows them to convert grant proposals into awards with just a click of a button. The grants management solution can also be integrated with third-party applications from other vendors. If you are considering PeopleSoft Grants Management it may also be beneficial to examine other subcategories of Best Grant Management Software listed in our database of B2B software reviews. It's crucial to note that hardly any service in the Grant Management Software category will be a perfect solution that can fulfill all the goals of various business types, sizes and industries. It may be a good idea to read a few PeopleSoft Grants Management reviews first as specific services might excel exclusively in a very small set of applications or be designed with a very specific type of industry in mind. Others can function with an intention of being easy and intuitive and therefore lack complicated features welcomed by more experienced users. You can also find services that support a wide group of customers and offer a complex feature toolbox, but that usually comes at a more expensive cost of such a solution. Ensure you're aware of your needs so that you purchase a solution that offers specifically the functionalities you search for. How Much Does PeopleSoft Grants Management Cost? PeopleSoft Enterprise Grants Management offers a single enterprise pricing plan which you can avail by purchasing a license at a price of $7,125 and with a minimum of 5 users. On top of the component license fee, there is a corresponding fee for software update license and support which is $1,567.50. Please contact Oracle’s sales department to get more pricing details. We realize that when you make a decision to buy Grant Management Software it’s important not only to see how experts evaluate it in their reviews, but also to find out if the real people and companies that buy it are actually satisfied with the product. That’s why we’ve created our behavior-based Customer Satisfaction Algorithm™ that gathers customer reviews, comments and PeopleSoft Grants Management reviews across a wide range of social media sites. The data is then presented in an easy to digest form showing how many people had positive and negative experience with PeopleSoft Grants Management. With that information at hand you should be equipped to make an informed buying decision that you won’t regret. What are PeopleSoft Grants Management pricing details? What integrations are available for PeopleSoft Grants Management? PeopleSoft Enterprise Grants Management supports integration with a wide range of applications that comprise the PeopleSoft Enterprise software product suite. It can also be integrated with third-party systems. If you need more information about PeopleSoft Grants Management or you simply have a question let us know what you need and we’ll forward your request directly to the vendor.